At Smokey's Hive, all of our candles are made by hand, giving each one its own unique look. 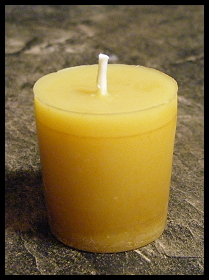 All candles are made using 100% beeswax, which burns soot free, and burn approx. 15% longer than other wax candles. Being made of beeswax, they have a slight hint of honey scent remaining. 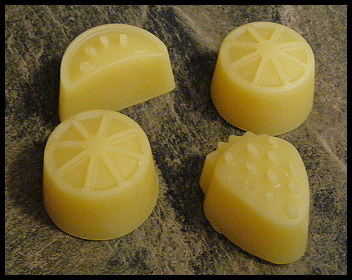 Due to being made from natural beeswax, coloring may vary from the candles pictured below. Each votive stands approx. 2 inches tall and is slightly tapered from top to bottom, measuring 1-3/4 inches at the top and 1-3/8 inches at the bottom. With an approx. burn time of 15 hours, these candles have a variety of uses, and are sold in sets of 3. 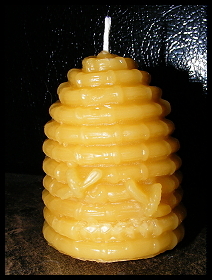 The skep hive candle is both practical and decorative. Standing approx. 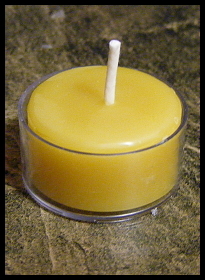 3 inches in height with a diameter of 2-1/4 inches, this candle contains about 3.5 oz of natural beeswax. These tealights stand approx. 3/4 inches tall, measure approx. 1-1/2 inches across, and are packaged in a plastic tealight cup. Burn time for the tealights is approx. 3-4 hours. Tealights are sold in sets of 3. These secented tarts have an "burn" life of approx. 10 -12 hours each. 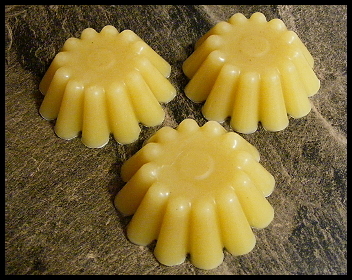 Beeswax tarts work better in a warmer with tealight than in an electrice warmer due the the higer melting point of beeswax. Place candle on protected surface and burn until a small puddle forms across the entire top of the candle. Keep wick trimmed to ¼ inch. DO NOT place tea light in plastic cup in an enclosed container to avoid melting of the tea light cup. Never leave a burning candle unattended and only burn on a heat resistant surface. Beeswax has a higer melting point than other waxes. Tarts may not melt properly in some warmers that use a ligth bulb, and may requre the use of a tea light for proper melting.